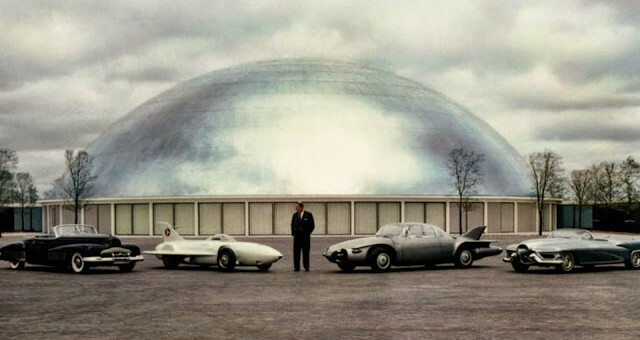 Harley Earl stands with the Buick Y-Job, Firebird I, Firebird II, and LeSabre Concept cars outside the GM Design Dome. Few buildings hold more prominence in the auto industry than the General Motors Design Dome, which stands on the campus of the General Motors Technical Center in Warren, MI (which itself is already a national landmark). Designed by famed penman Eero Saarinen and opened in 1955, the silver, hemispherical building is to GM what the Death Star is to the Dark Side, both in looks and importance. While it’s not quite capable of powering up a superlaser and obliterating planets (to the best of our knowledge), nearly every vehicle GM has made since 1956 has passed through futuristic-looking Design Dome on its way to the production lines. From the 1957 Chevy Bel Air to the fabled ‘63 Corvette split-window coupe, to the 2002 Cadillac CTS and the 2011 Chevy Volt, nearly every vehicle the company has ever created since ’56 has passed through the domed super structure at one point or another. Now, after nearly 60-years in orbit, the famed Design Dome will finally receive its first major renovation, according to the Detroit Free Press. Originally thought-up by legendary GM Design Chief Harley Earl, the dome was created as a place for designers to view and craft their creations in a secret structure that could simulate natural light, with a tree-lined courtyard outside for external display. After 18-months of renovations, the interior now features a new LED lighting system that can be adjusted from an iPad, drop-down projector screens, and a brand new lighting system that can be controlled remotely. The old, tired trees in the courtyard were also replaced with new ones, but fear not GM-fans, the company harvested the old lumber and used it to create some artistic installations like an electric guitar and a wood-framed bicycle. ‘Cuz why not. Check out the Freep’s video below for a more in depth look at the renovations and a chat with Welburn.